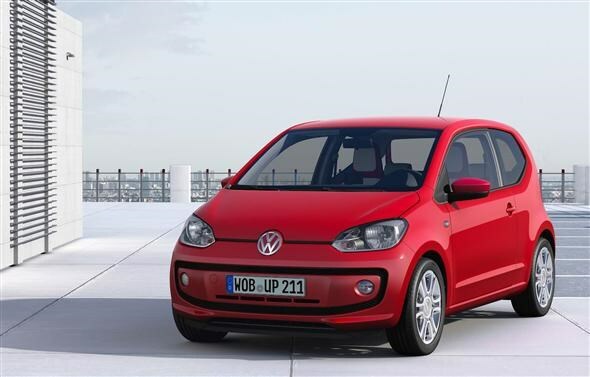 First pictures of Volkswagen's baby "Up"
New pictures have been released of Volkswagen's new compact city car, the up! - which we'll be calling the Up from here on in. The new car will be making its debut at the Frankfurt motor show in September. It is an entirely new design from the German car maker and it's aimed at offering plenty of interior space while remaining small enough to be ideal for city driving. Three versions of the Up will be available - the entry level "take", the comfort based "move" and the range-topping "high". There will also be two special edition models available from launch and based on the high Up; the Up black and the Up white. No prizes for guessing what the changes will be with those. Powering the Up is an all-new 1.0-litre three cylinder petrol engine, which is available in either 58bhp or 73bhp outputs. In economical BlueMotion Technology trim - which will include a stop/start system - the Up is claimed to return an average of 67mpg from the lower-output 58bhp petrol engine. Volkswagen says that the emissions for the BlueMotion version are less than 100g/km of CO2, meaning free road tax and no congestion charge fees. There are also plans for an all-electric version, ideal for shorter tips and inner-city commuting. The Up will be one of the smallest four-seater cars, yet it's reputed to offer plenty of interior space thanks to a compact engine that's mounted as far forwards as possible. To give some sense of scale it has the same footprint as the diminutive Fiat 500. Despite its compact exterior dimensions the boot is a relatively spacious 251 litres, 66 more than the aforementioned Fiat, with available space rising to 951 litres with the rear seat folded down - almost as much as some conventional full-size hatchbacks. 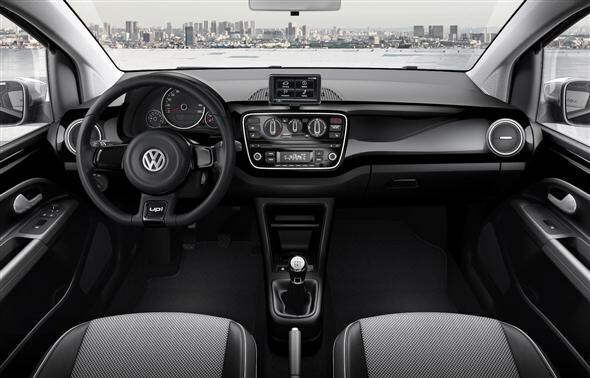 Inside the Up gets lots of neat little details that are designed to make it easier to live with, along with a level of quality that Volkswagen claims will "enhance the market segment". Buyers can pick from a choice of trim colours in order to personalise their Up. Although it's a small city car the Up is available with some big car extras, such as its optional city emergency braking system. It's a system that activates under 18mph and uses a laser to detect the risk of impending collision. If you're going to collide with something, the Up will apply the brakes to slow you...down, reducing the damage done. Depending on specification, or available as optional extras, buyers can also get equipment such as cruise control, an auxiliary connection for MP3 players, heated seats, air-con and a trip computer. The Up also comes with a new combined navigation and media system called "maps + more". It's a small removable device that clips in place above the dashboard, allowing the user access to satellite navigation, telephone, information and entertainment systems. It integrates with the car's systems and can display additional information, such as parking sensor readings, when necessary. Owners can also tailor the maps + more system with a range of additional applications, to suit their specific needs. 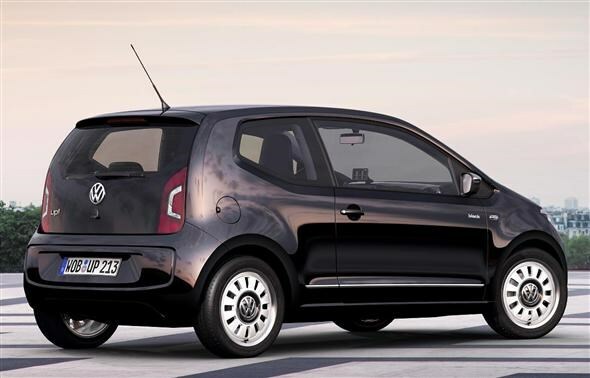 The Volkswagen Up will go on sale in spring 2012, with prices predicted to start at around £8,000.